is uniquely different than all other single spindles CNC drill lines currently on the market. This new product line features an exclusive secondary “X” axis with improved accuracy and productivity as it is not necessary to unclamp, reposition and re-clamp for each “X” axis (length axis) movement. This capability also permits scribing on all four surfaces to eliminate all manual layout which can be automatically imported from such CAD systems as SDS2 as a DSTV file or Tekla in the form of an XML file. The secondary axis also provides the ability to generate slotted holes, copes and large holes that exceed the maximum capability of the Excalibur 12. The Excalibur is also furnished with a ball screw spindle feed that features a 25 HP direct drive spindle design that generates up to 3,000 RPM to use carbide tools to their maximum capability. Once the spindle is at the programmed position, top and bottom internal clamps quickly secures the material as the drill positions to the programmed gauge line and commences drilling. in either flange or the web. 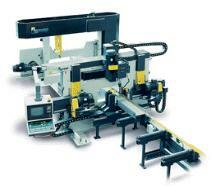 The software automatically changes the required feeds and speeds based upon the tool that is loaded into the spindle. 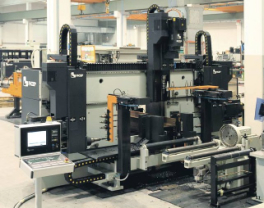 Ficep Corporation produces five different models of stand-alone CNC controlled multi spindle drilling lines for the fabrication of structural steel. For more information, contact Metalfab, Inc., or visit www.ficepcorp.com.